The GoofBoard is a new balance trainer (similar to the Indo Board) that has been specifically designed for surfers. 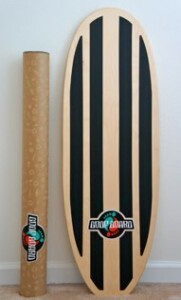 The GoofBoard was created by Armin Brown, “for surfers as a way to bring home the surf riding experience AND return to waves the better for it.” Armin was looking to create a balance trainer that simulated the feeling of trimming down the face of a small wave, while offering a true rail-to-rail surfing feel. Now, I’ve been an IndoBoard user for many years, and while fun, I never thought it did a good job of simulating the balance needed for surfing. And, this is where I think the GoofBoard really shines…it feels a lot like surfing, and the balance needed to Goof is almost identical to the balance needed to surf and trim on waves. I’ve been using my GoofBoard for about a week, and have been having a great time learning and improving. It has been an awesome source of entertainment for me and my friends……they’ve been coming over for GoofBoard contests and style practice! 1. GoofBoard allows you to stand in proper surfing stance…meaning, you can stand on the GoofBoard using the exact stance you use on your surfboard. 2. Goofboard allows you to walk (cross step) up and down the deck…very similar to longboarding. So, if you’ve been wanting to practice or improve your cross-step, GoofBoard is definitely the right equipment to use when not surfing. 3. GoofBoard focuses more on side-to-side balance, rather than front to back balance. Notice the GoofBoard places the pipe parallel to the board, which helps to simulate rail-to-rail surfing very well. 4. GoofBoard does help to improve leg strength and can offer a bit of a workout. Basically, balancing equipment like the Goofboard helps to build intrinsic (small) muscles in the foot, ankle and lower leg, which improves balance and coordination. Additionally, I think it even helps to exercise the core, which is an important area for stabilization.